Present Owner: Mennonite Properties Inc.
Beginning in the 1880s the Province of Manitoba embarked on an ambitious program to provide its disadvantaged citizens with the most up-to-date care. Over the years, large facilities were built throughout the province for those suffering from tuberculosis and for individuals with mental illnesses. 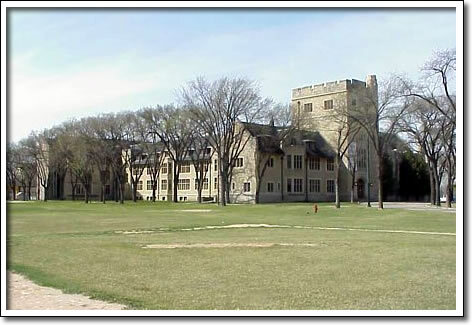 In Winnipeg a building was constructed in 1890 to provide accommodation, and training facilities, for deaf children. By 1912 the original building was insufficient to meet the increasing numbers and needs of residents. The institute was given temporary accommodation in various facilities until superintendent H.J. McDermid persuaded the government to provide students with a custom-built campus. The architect chosen for the work was John D. Atchison, a highly respected Winnipeg architect. The original plans were scaled back to the present structure, which was built in 1921–22. In his design, Atchison created one of the province's finest buildings. Following the then-popular Collegiate Gothic style, the building is an exceptional interpretation of that style. It is at once impressive, through its size and obvious cost, but also informal through its many and varied details. The interior is equally fine, spacious and carefully detailed with fine materials, including broad Tudor arches carried out in Manitoba limestone. In 1996 the School for the Deaf ceased operations in this building, which finds new life as the campus for the Mennonite College Federation.